We are currently booking guided fishing trips on Lake Coeur D' Alene for pike and Chinook Salmon. Summer Sockeye and Chinook Salmon on the Columbia River. These trips book quickly so don't wait!! Adventure Guide Service specializes in guided fishing trips on Lake Coeur D' Alene, Priest Lake, and Lake Pend Orielle in beautiful North Idaho. 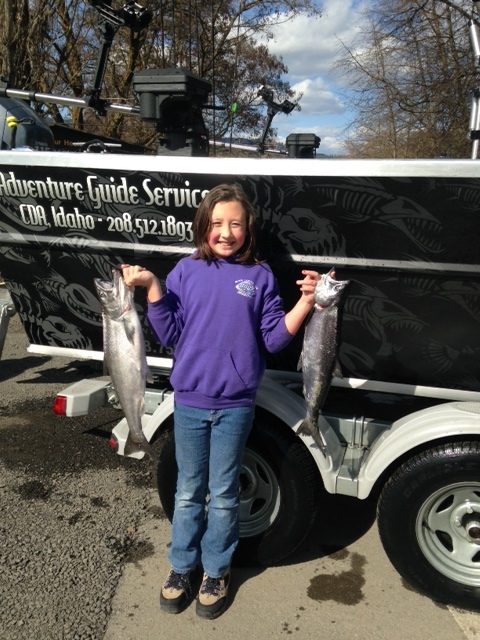 We also provide guided fishing trips for Salmon on the Columbia River. Chinook Salmon, Kokanee Salmon, Lake Trout, Kamloop Rainbows, Northern Pike and Bass are just some of our specialties! For your next fishing adventure choose Adventure Guide Service!